Purposefully – Walking in Freedom! Many, many times, I ask myself, why on earth should I encourage God’s people (especially when I’m having one of those not-so-very-good days)? However, when I’m struggling with walking boldly in my purpose, the Lord reminds me of His word and what He has called me to do. 3-5 All praise to the God and Father of our Master, Jesus the Messiah! Father of all mercy! God of all healing counsel! He comes alongside us when we go through hard times, and before you know it, he brings us alongside someone else who is going through hard times so that we can be there for that person just as God was there for us. We have plenty of hard times that come from following the Messiah, but no more so than the good times of his healing comfort—we get a full measure of that, too. 6-7 When we suffer for Jesus, it works out for your healing and salvation. If we are treated well, given a helping hand and encouraging word, that also works to your benefit, spurring you on, face forward, unflinching. Your hard times are also our hard times. When we see that you’re just as willing to endure the hard times as to enjoy the good times, we know you’re going to make it, no doubt about it. ( 2 Cor. 1:3-7, MSG). Because God comforts and encourages me, He has called me to encourage you. Today I find myself doing what I urge others NOT to do on Mondays, mope. Yep, I’ve got the Monday Moping Blues and I’m in a funk. My emotions are a mess. I hate feeling and being this way. But it’s where I am right now. Consequently, I am deliberately fighting to tame that Emotional Beast! But thank God for Jesus! Using one of the principles from, It’s Monday… Already, the Lord is encouraging me. M– No moping on today! Don’t grumble, pout, complain, or sulk. Rejoice instead (Phil. 4:4). Do you have the Monday Blues? Are you moping today? Finding it difficult to get your Monday moving in the right direction? (Join the club!) Seriously, may I encourage you as the Lord is encouraging me? Rejoice in our great Father, my friend! Philippians 4:4 commands us to “celebrate God all day, every day” and “revel in Him” (MSG). That means to take great pleasure in the Lord. Relax and find peace in the presence of God. Show great joy and delight by exalting His magnificent name. Think about His goodness and the victory He gives to all who call on and believe in His great and holy name. Make music and melody. Shout forth praises and jubilation unto our marvelous King for all of His mighty works. If we do these things, I am confident that our behavior and attitude will change from sadness to gladness, from complaining to thanking, and from moping to rejoicing. I already feel better!! My sisters, it’s Monday….already! And there’s nothing we can do about it, but what we can do is rejoice in our all-sufficient Savior. We have been blessed with another day to celebrate our Jesus and the abundant life He gives to us. Now, let us purposefully make it a great day! 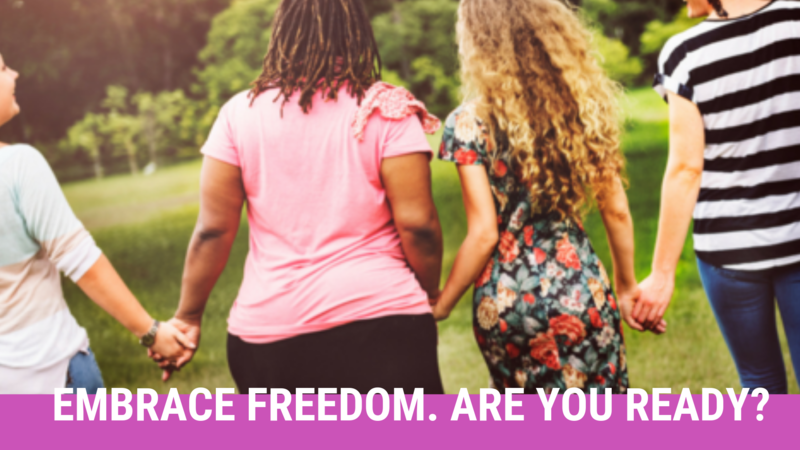 LET’S WALK IN FREEDOM TOGETHER AND IMPACT THE WORLD!